Do you want long lasting, shine free care every day? 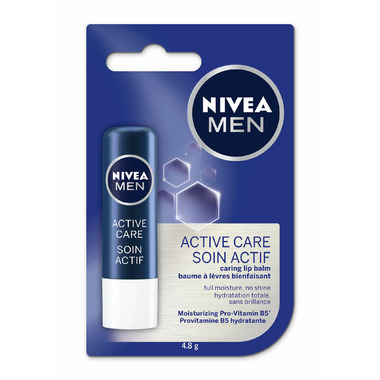 NIVEA Men Active Care with Hop Extracts combines intensive moisturization and protection to leave lips supple and healthy looking. NIVEA for lips that love to talk, smile, laugh and kiss. Bought it for my husband and he loves it. It's a good price. Will definitely be buying more. This product works for my husband. He loves it. This works quite well. I detect no odor. While it does feel good once applied, it does not last as long as others. Not bad! Does not have a shine as with most other lip balms though I wouldn't call it a men's lip balm just for that. It doesn't have any UV protection though! Overall, quite decent but not useful if you're planning to do some sports (you're better off getting a lip balm that is meant for sports and has UV protection). My first lip balm i tried in my life, After 15 days of usage i throwed it in garbage. Not at all effective, hard on lips and leaves awhite residue. Got this for my bf. He likes this stuff a lot, keeps the lips moist. Been using this product for a couple months now and I'm satisfied with it. Does the job for dryness, could last longer thought. The best thing about it is that it is not messy. Sticks quickly to the lips for instant dryness relief. I would rate it 5 stars if it would last a little longer. Good product overall. I really like this product I feel like it lasts long. I use it at night mostly and when I get up in the morning my lips still feel moisturized and not dry at all. My husband uses this lip treatment and got me totally addicted to it. I use this every night before bed in the winter time to keep my lips moisturized. I have tried so many other kinds of lip treatments and this one is both simple and effective. It has zero taste and a little goes a long way. Definitely a great deal! Not that great, didn't last very long. Need to apply alot.